In a large Dutch oven or stock pot, heat butter or oil to medium-high heat. Add onion and carrot and saute until just starting to soften, about 3-4 minutes. Stir in garlic. 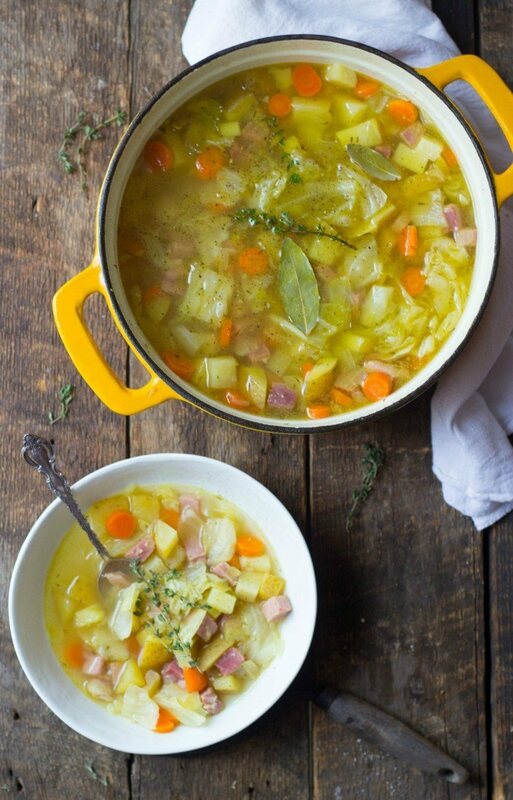 Add potatoes, cabbage and ham and stir to combine. Stir in thyme leaves, salt, black pepper and celery salt. Add the chicken stock and bay leaf and bring to a simmer. Place lid on pot and reduce to a very low simmer. Allow to cook 30-35 minutes, until potatoes and cabbage are soft. Stir in bouillon. Taste and adjust seasoning, if necessary.